A team of students from Penn Manor and Hempfield was a top finisher in a statewide hacking competition held recently at Hershey High School. 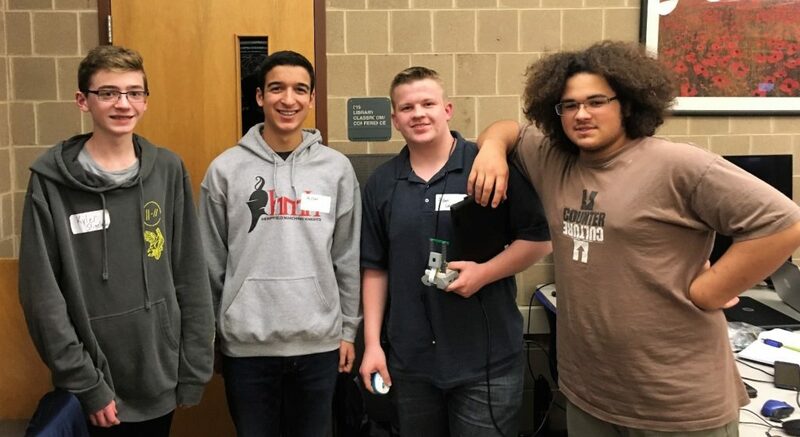 Kyler Stigelman, Aidan Lewis and Tristen Martin of Penn Manor and Michael Pagano of Hempfield placed second overall in HackHershey, a 12-hour programming competition that attracted 21 student teams from across Pennsylvania. The projects were judged on originality, technical difficulty, polish and usefulness. The four students developed an app called Face2Password that uses facial recognition software to assist people who forget their passwords. “The team had a fully working program completed in less than 10 hours, which was really impressive,” said Gina Kostelich, Penn Manor Student Help Desk specialist, who helped prepare Team Face2Password for the competition. The Penn Manor students all are enrolled in the Help Desk Course at Penn Manor High School, in which they complete repairs and provide technical support for student computers under the 1:1 Laptop Program. Help Desk students earn credits and work under the direction of Penn Manor’s professional information technology staff. Tristen is a senior and Kyler and Aidan are sophomores at Penn Manor. Michael is a sophomore at Hempfield. The students received $600 worth of prizes, including a computer monitor, Airpods and Snapchat Spectacles, for their second-place finish. Team members, from left, are Kyler Stigelman, Michael Pagano, Aidan Lewis and Tristen Martin.